Some say being an SES volunteer calls for ‘blood, sweat and tears’ … and our volunteers take it literally! 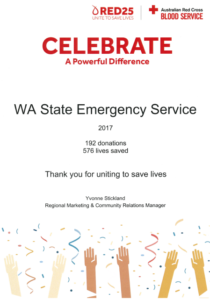 We are very proud to have participated in Red25 the group donation program of the Australian Red Cross Blood Service where organisations across the country work together to achieve 25% of the blood donations needed by Australia. 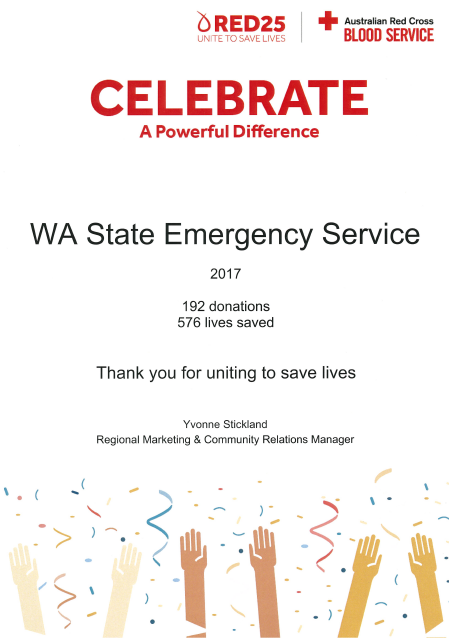 Our volunteers not only generously donate their time during emergencies, they have also contributed to the 192 donations of blood products from the WA SES Red25 team that helped save 576 lives in 2017. Phew… what a tremendous effort! ← Curious about life in the orange overalls? ?